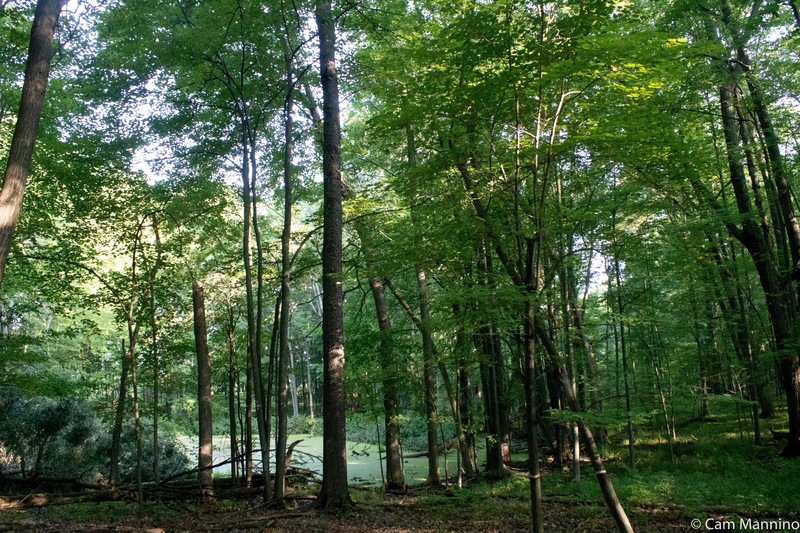 Watershed Ridge Park offers an adventurous, challenging hike on a hot summer day. No trails exist yet to lead you through Watershed, since it’s not yet developed. But you can park by the evergreen trees just east of the maintenance shed and explore from there (approximately 1664 W. Buell Rd). This park is named for a watershed boundary, a high point within the park, that causes precipitation to flow in two directions, ultimately feeding both Paint Creek and Stony Creek. The diversity of habitats is remarkable. Large areas of the park have agricultural fields that are tilled and planted by a local farmer, which helps keep invasive plants out until the area can be restored to natural habitat. But once I step out of the farm fields, the magic begins! 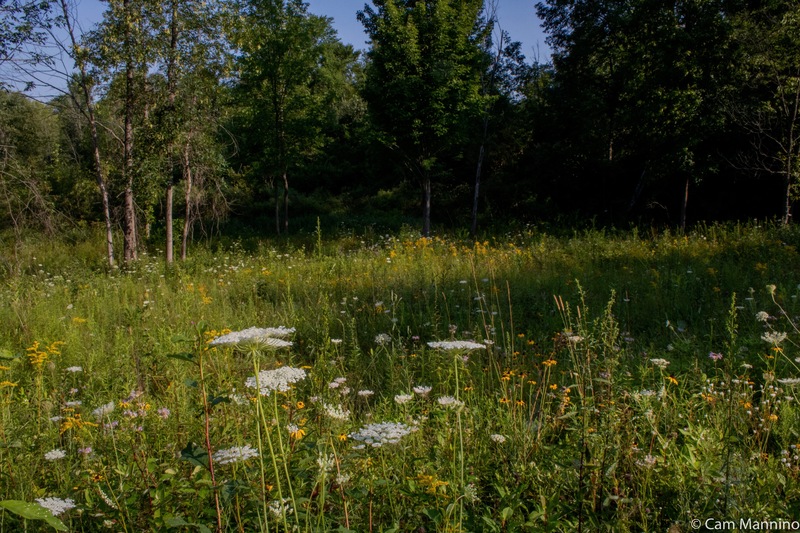 A forest with vernal pools, a bright meadow, a boggy swamp shaded by trees, a seasonal stream, and a hidden marsh surrounded by a nearly impenetrable circle of native shrubs. So feel free to join me as I walk through some of this wild and wonderful park on a hot summer day. I started down the edge of the farmer’s field to the west of the maintenance shed, walking carefully so as not to damage the Fogler’s soybeans. The field was dotted with wildflowers, like Pale-leaved Sunflowers (Helianthus strumosus) which attracted the attention of the Red-spotted Purple (Limenitis arthemis), a butterfly that seems to be plentiful this year! 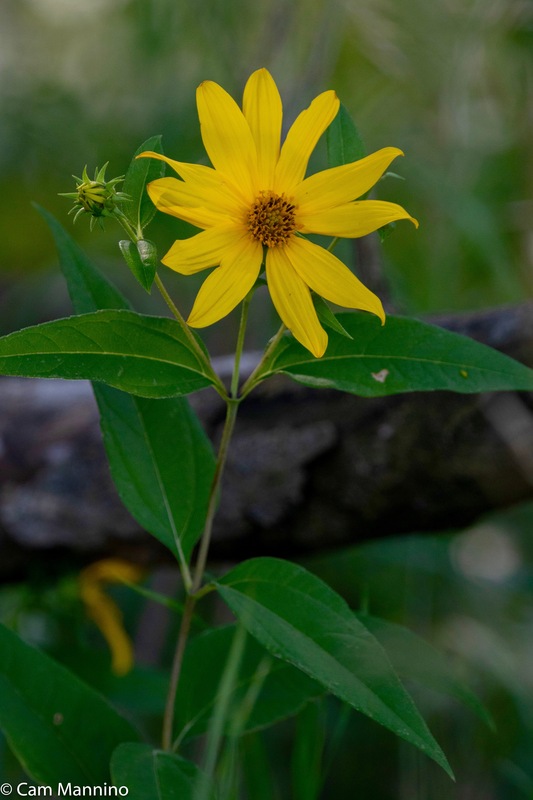 Pale-leaved Sunflowers shine in the shade under the trees that line the farmer’s field. 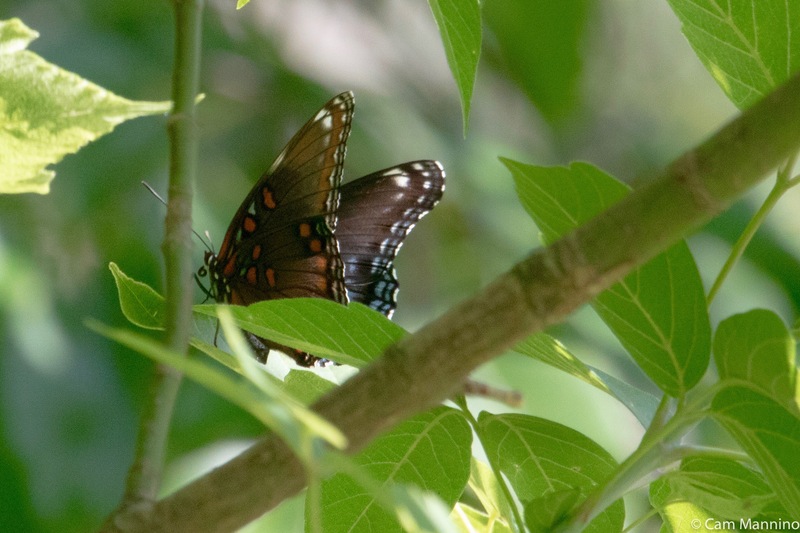 A Red-spotted Purple butterfly rests in the cool shade near the sunflowers. Once I entered the cooler woods on the north edge of the field, I began to see blue-green wetlands shining in the dim, dappled light. Blue-green wetlands glow in the distance as you enter the forest. Oh yes, mosquitoes buzzed, but I patted on more insect repellent and headed for the water, because I knew that’s where I’d see the most wildlife. And sure enough, as I settled on a log near the water, a rustle behind me turned out to be a young White-tailed deer buck (Odocoileus virginianus) peering curiously at me from behind the greenery. 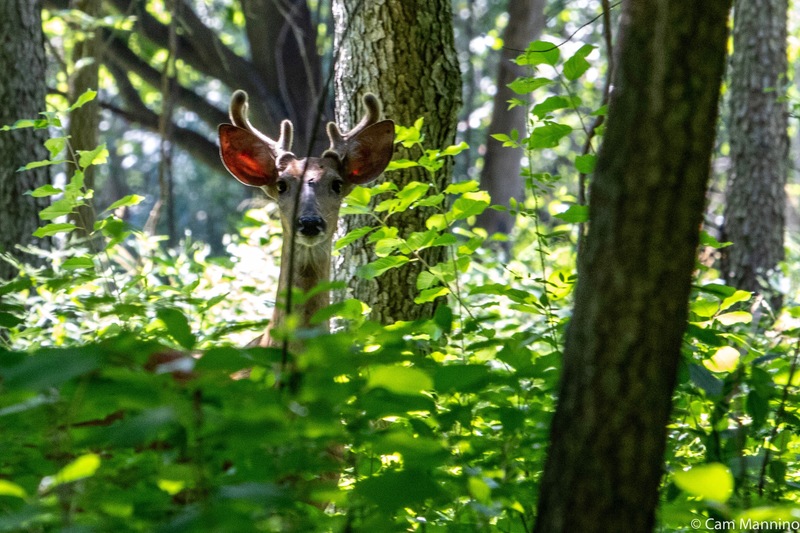 A young buck stares intently at me from the greenery near a wooded wetland in the forest. I could hear an Eastern Wood-Pewee singing plaintively in the distance, a nice soundtrack for my entrance into a mysterious forest. A plop! at my feet made me aware of a young Green Frog (Rana clamitans), covered in Duckweed (genus Lemno), who’d been basking on a log just moments before. 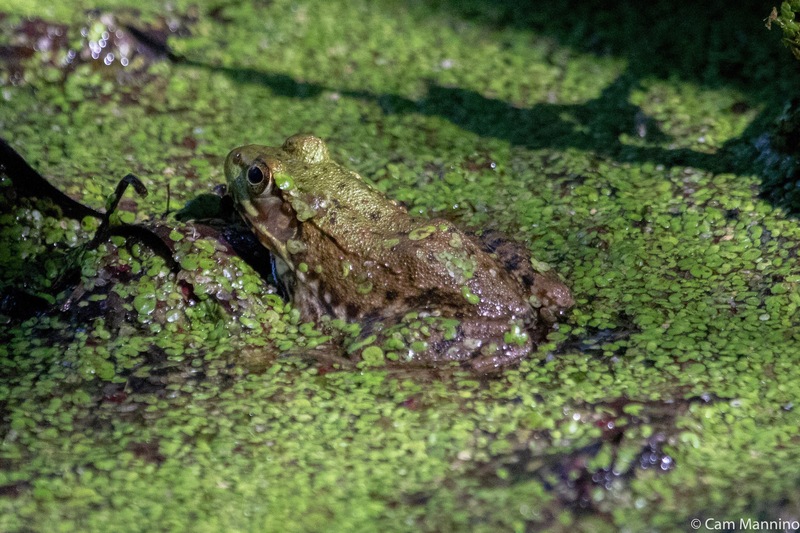 A young Green Frog cools down among the Duckweed in a shady wetland. Far out in the water, two Twelve-spotted Skimmer dragonflies (Libellula pulchella) chased each other around a fallen willow until one finally settled for a moment. It was too far away for a good shot, so here’s my photo of a male in Bear Creek marsh several years ago. 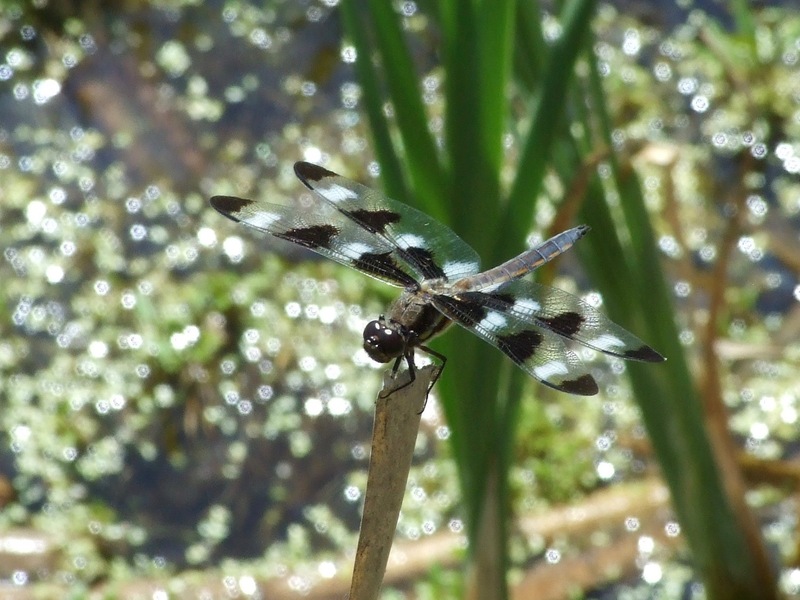 A male Twelve-spotted Skimmer settles on a stalk in a marsh. The forest wetlands were a busy location for courting that afternoon. A pair of Emerald Spreadwing damselflies (Lestes elatus) had evidently mated just before I arrived. Below you can see the female grasping the stem, her abdomen curled inward, preparing to lay eggs on a plant, while the male above keeps a wary eye for predators or other males. 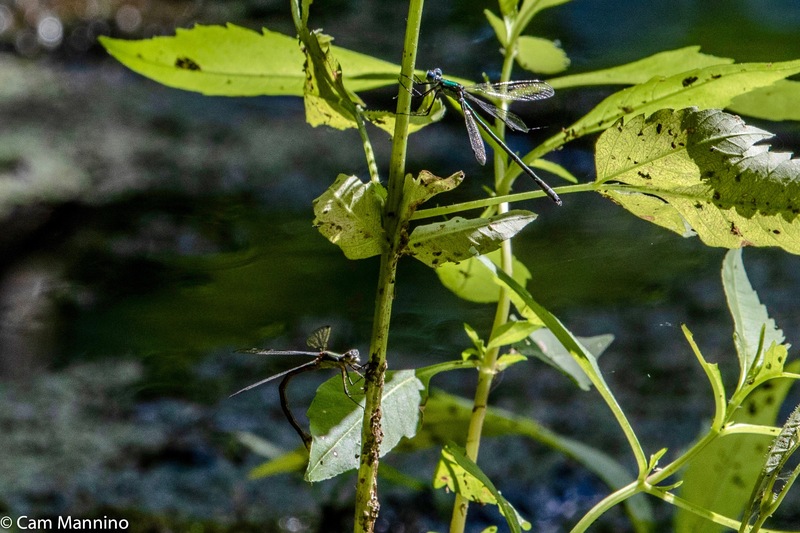 The female Emerald Spreadwing Damselfly curls her abdomen to lay eggs on a plant while the male guards her from above. It was hard to see how glamorous these Emerald Spreadwings are in the dim light, so I was pleased when a male landed in the sunlight nearby. 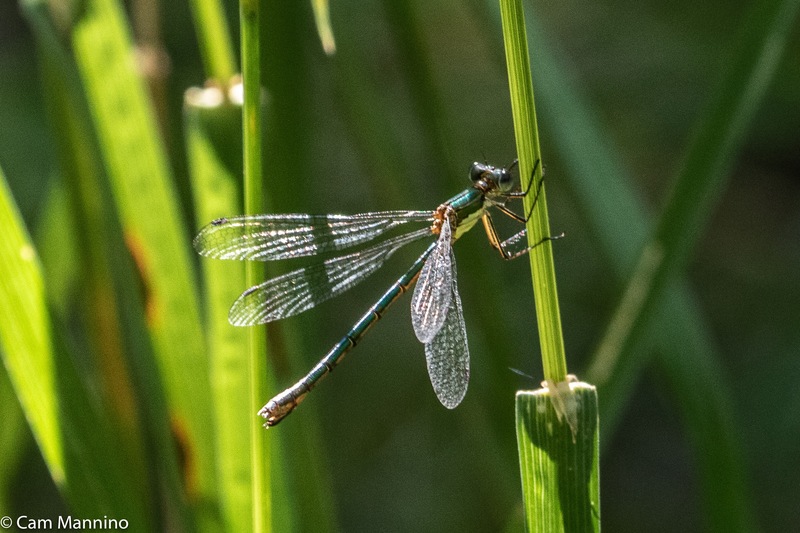 A male Emerald Spreadwing stops in the sunlight for a moment. One of the stumps in the wetland was decorated with the wheel-shaped web of an Orb Weaver Spider (family Araneidae). It glowed in a ray of sunlight. According to Wikipedia, “Many orb-weavers build a new web each day. Most orb-weavers tend to be active during the evening hours; they hide for most of the day. 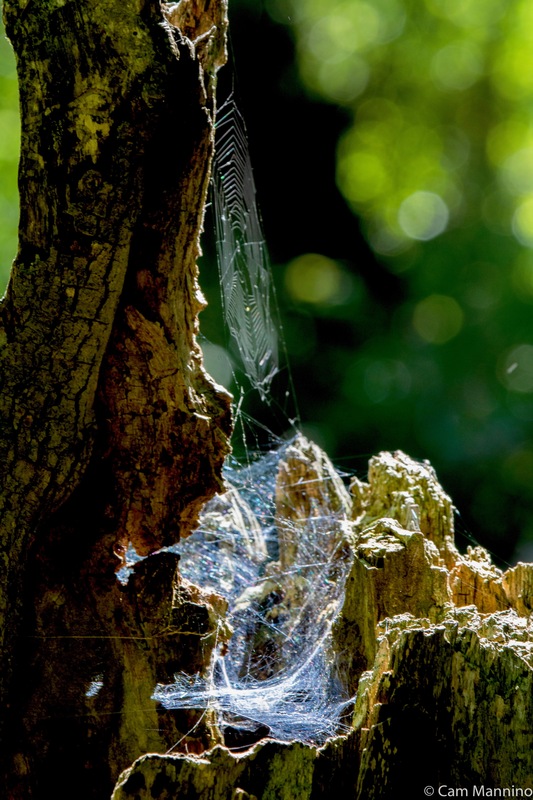 Generally, towards evening, the spider will consume the old web, rest for approximately an hour, then spin a new web in the same general location.” Very tidy, eh? That might explain why I never saw the spider and there was virtually no detritus in the web. I’m not sure what to think about the extensive web on the stump below. A practice run? 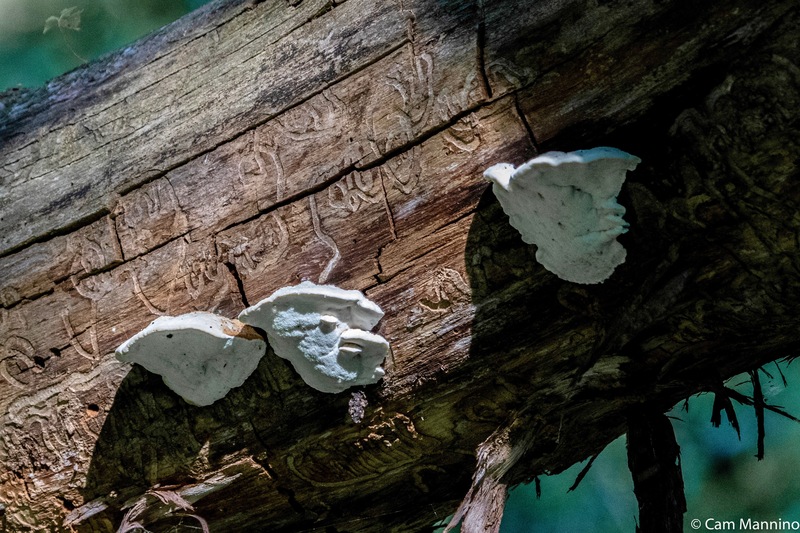 At the water’s edge, three “conks” of Shelf/Polypore fungi shone white against the tracks in the wood, maybe the feeding galleries of emerald ash borer larvae . Three shelf fungi “conks) on a log traced by a tunneling bark beetle. 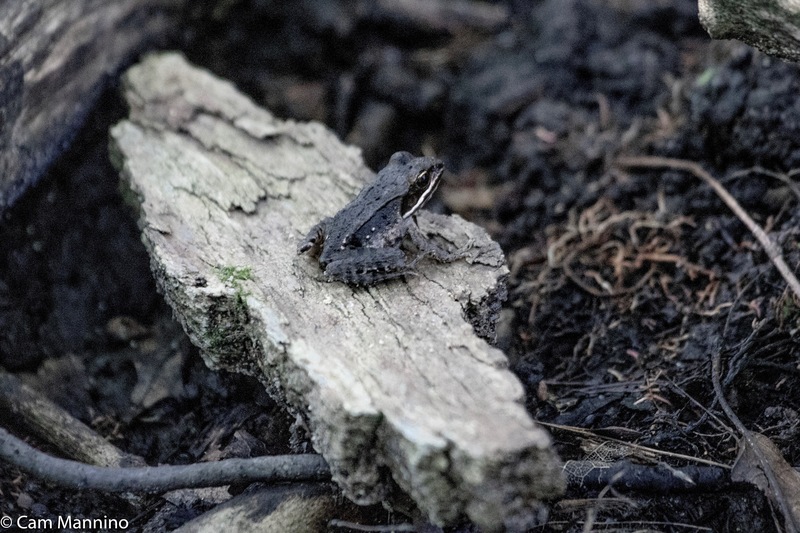 Near another shady vernal pool wetland, I spotted a tiny Wood Frog (Rana sylvatica) gazing toward the water from a small piece of wood. Perhaps it was a fond last look since this little creature will soon move uphill a bit from the forest pool in which it hatched. Finding a place to hibernate under the leaf litter, it will freeze solid until spring. No heartbeat, no breathing, no movement. This seeming miracle is made possible by a glucose anti-freeze of sorts produced by its liver. As regular readers of the blog know, this strategy for survival never fails to astonish me. Perhaps this tiny Wood Frog is contemplating its winter hibernation when it will freeze solid. As I neared the edge of the woods, where it opens to the meadow, familiar plants were there to greet me. I could have wished for less attention from Enchanter’s Nightshade, (Circaea canadensis) which at this time of the year is producing seed within burr-like fruits. Looking high into the trees, I strayed into a large patch and my socks were covered. For the rest of my walk, I became a transportation vehicle for Enchanter’s Nightshade fruits! 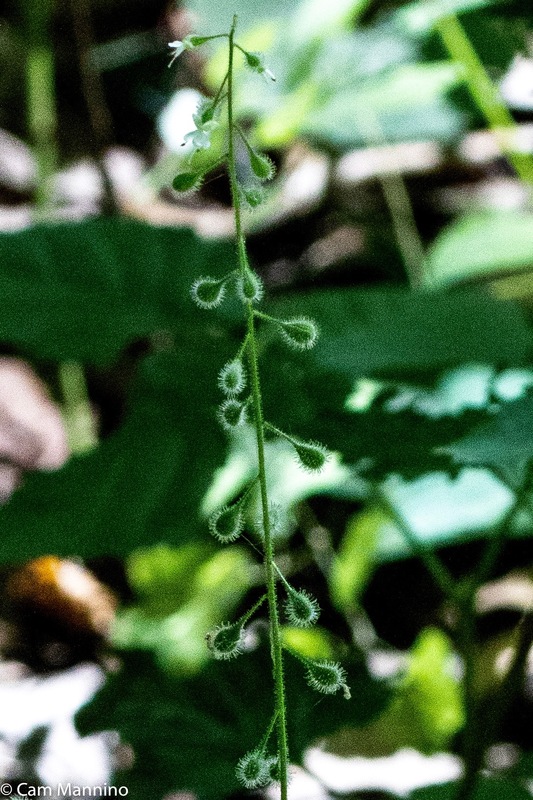 Enchanter’s Nightshade lies in wait for passersby to carry its seeds away to new locations. My socks, for example, make a fine carrying device. 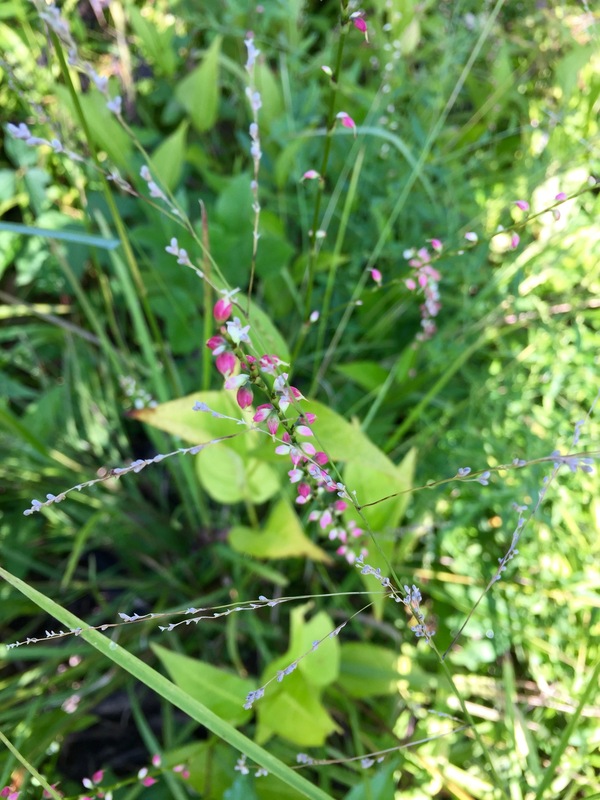 Another forest edge plant, Jumpseed (Persicaria virginiana), spreads its seed in a different way. Once the seed is mature, any disturbance can send its seeds flying up to three yards! Once Jumpseed (pink flowers) produces mature seeds, bumping into the plants will propel the seeds up to 3 yards away. Another native wildflower that hugs the forest edge, Jewelweed (Impatiens capensis), is called Spotted Touch-Me-Not for the same reason. Its mature seeds also spring forth from the fruits when they are disturbed. 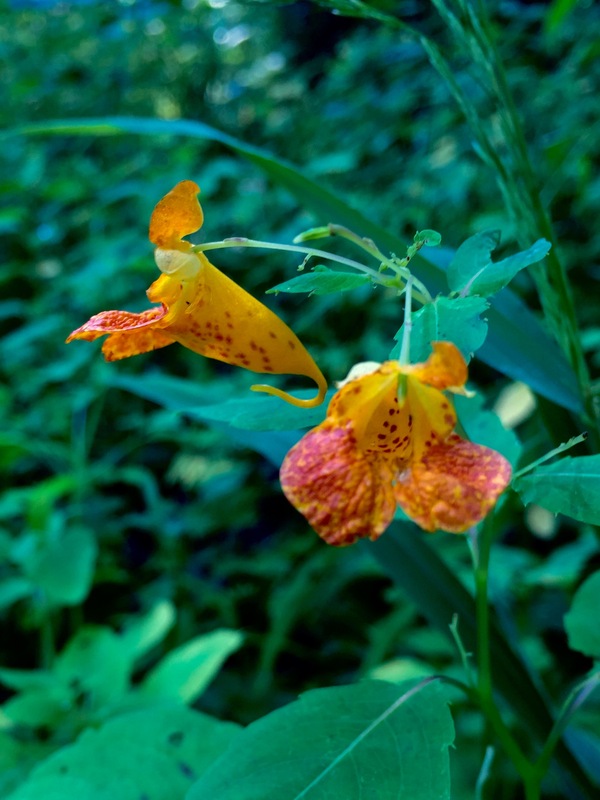 Jewelweed also throws out its seed when touched, earning its other name, Spotted Touch-me-not. 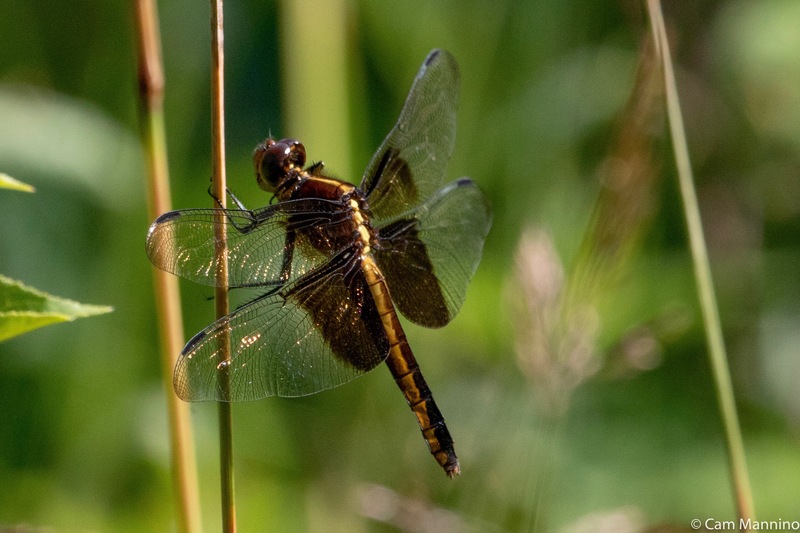 A female Widow Skimmer displays against a grass stem. 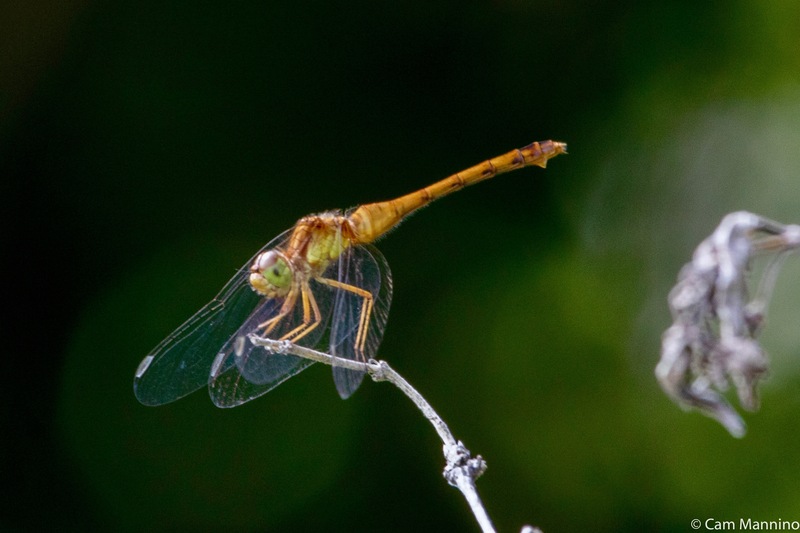 A female Meadowhawk in bright sunlight cools herself by positioning her wings and abdomen. 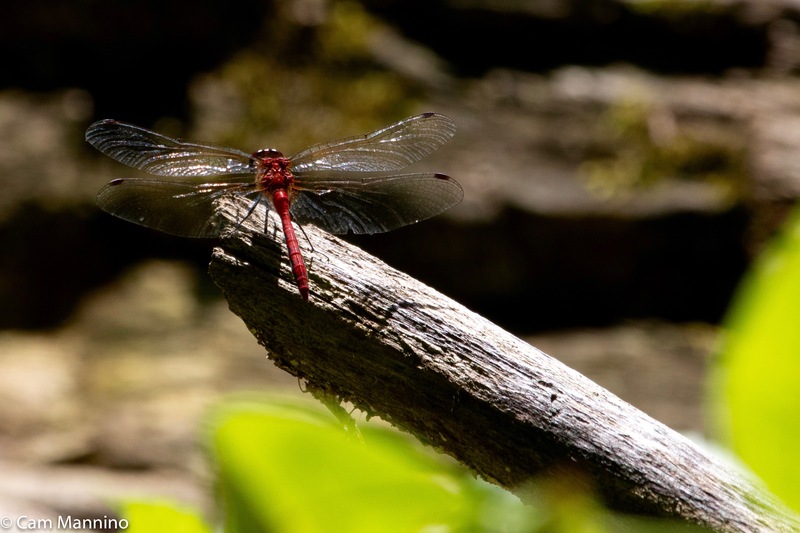 A male Meadowhawk nearer the marsh spreads his wings to attract a mate. As I struggled down toward the marsh, lifting my knees high to get through the lush tangle of stems, I begin to notice the plants near the marsh that love having “wet feet.” Mine, actually, were getting a bit wet, too! Hearing sharp chipping calls behind me, I turned around to find an adult Song Sparrow (Melospiza melodia) warning its offspring to stay out of sight. This may be a female since they often begin their molt later than males do. The youngster stayed out of sight within a nearby bush. 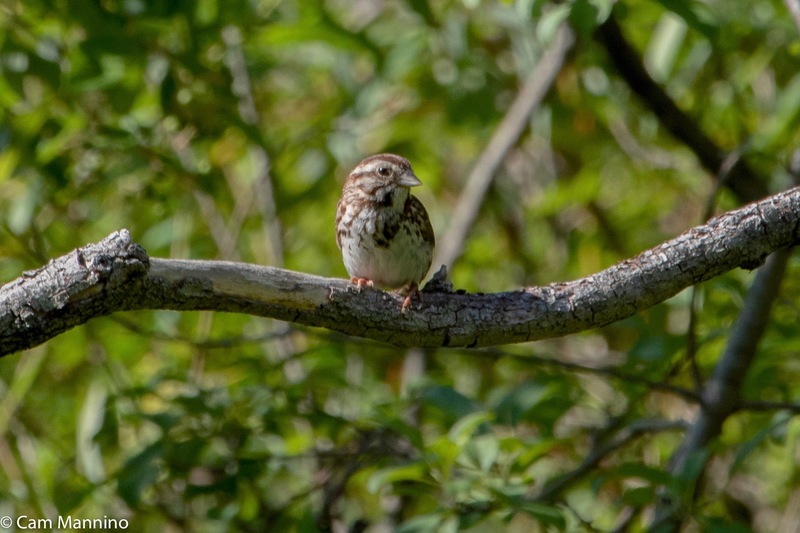 The adult Song Sparrow warned its youngster to stay hidden with a chipping call. Adult birds can be a bit scarce in late July and August because many are molting a whole new set of feathers. They’re generally not a pretty sight in the process, I can tell you! They’re not hiding out of vanity, of course; they’re just more vulnerable as wing feathers are replaced. I could hear the “witchety, witchety” call of the Common Yellowthroat (Geothlypis trichas)beyond the wall of native Gray Dogwood (Cornus foemina) which prevented me from seeing into the marsh. And a Gray Catbird (Dumetella carolinensis) “miaowed” from the Dogwood as well, making only a brief appearance. So I took the bird photos below in other parks at other times. A Gray Catbird during its molt at Bear Creek. The wall of Gray Dogwood bushes surrounding the marsh at Watershed Ridge Park. A Common Yellowthroat at Ilsley. Swamps are generally defined by ecologists as a forested wetland. Watershed Ridge Park has a beauty. 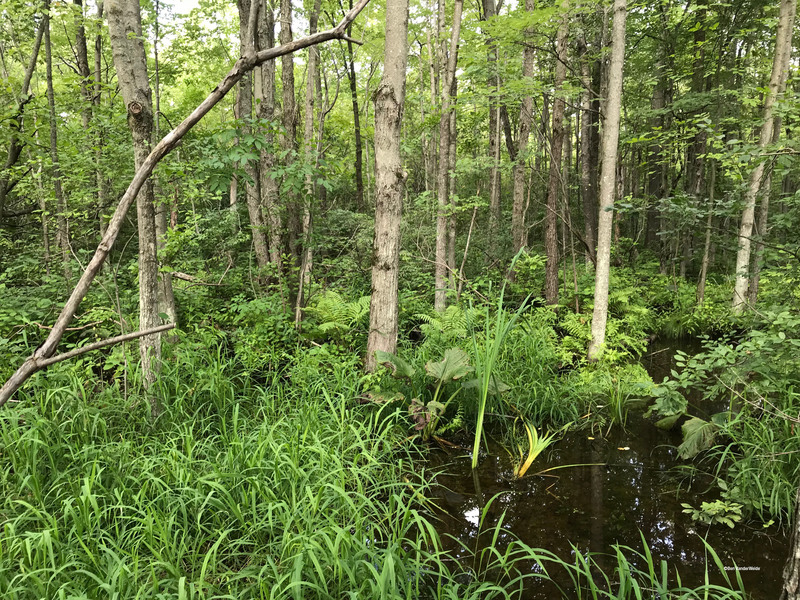 Ben VanderWeide, our township’s Natural Areas Stewardship Manager, put on his waders one afternoon and went to explore this habitat at Watershed Ridge while working on a plant inventory of the park. What an adventure! The water may look shallow, Ben told me later, but the muck beneath it can be very, very deep! To explore the swamp, Ben tested each step and only went into the water once he found firm footing. Otherwise, he stepped or jumped from one hummock to another. Some of the hummocks were made by “windthrows,” fallen trees uprooted by the wind which had become covered by vegetation. Others were made by stumps of trees that had probably been felled years ago and were now overgrown with plant material. 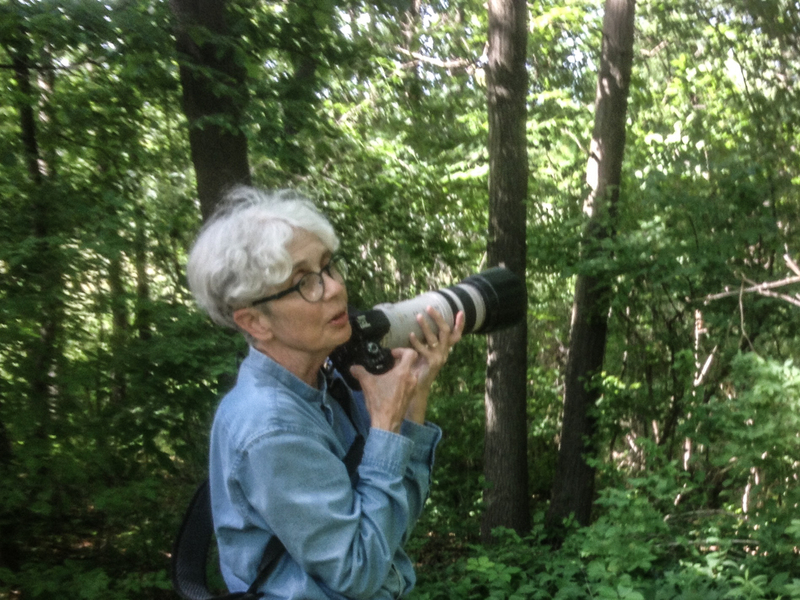 While moving from hummock to hummock, Ben spotted some interesting and unusual native plants. 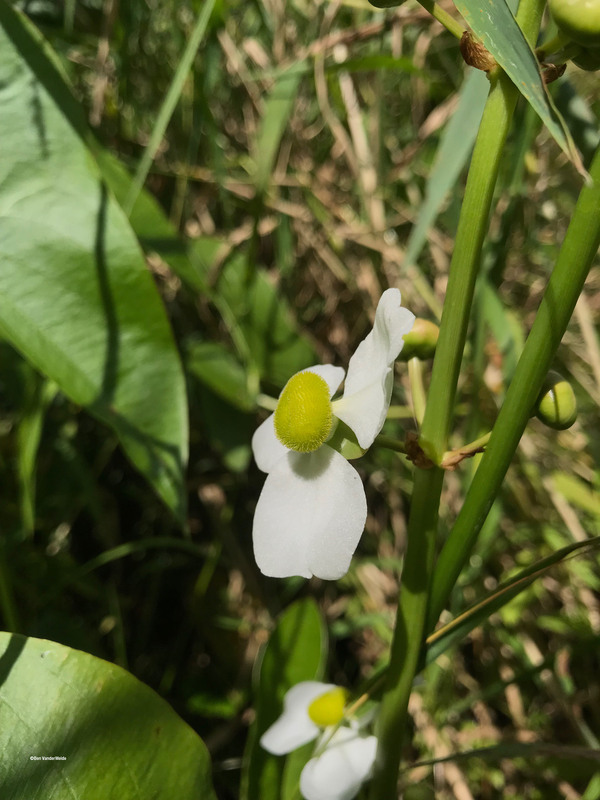 How about Duck Potato (Sagittaria latifolia), also known as Common Arrowhead? I know I’d never heard of that one before! Ducks and other creatures love to eat its submerged tubers which store nutrients for the flower’s regrowth and/or reproduction. And since, we humans love our favorite tuber – potatoes – why not the name Duck Potato? Duck Potato, so named because ducks and others eat their submerged tubers. 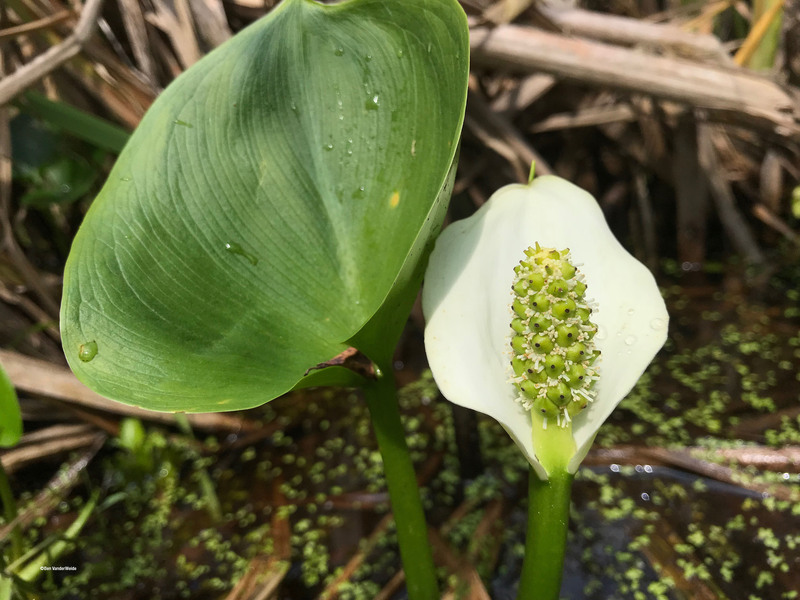 Ben found another unusual little beauty in the swamp, a Wild Calla (Calla palustris). Wild Calla is the only species in the genus Calla which is within the family Araceae. That family includes what are commonly called Calla Lilies (though they aren’t true lilies or in the Calla genus) and our old friend Jack-in-the-pulpit. It appears that the Wild Calla in Ben’s photo below had already been pollinated because, like Jack-in-the-Pulpit, the flowers are disappearing, replaced by green, berry-like fruits that will turn red in the autumn. Such a find! A Wild Calla whose flowers have already been fertilized . The resulting green fruits will turn red in the autumn. Ben also spotted a sedge that he’d never seen in our parks before. 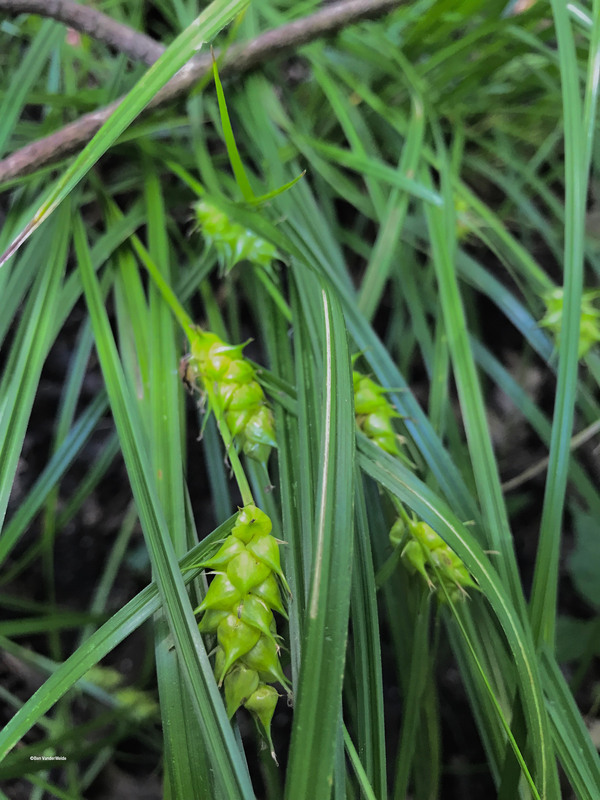 Sedges (plants in the family Cyperaceae) are a big family of plants that look like grasses or reeds, but have triangular-shaped stems instead of flat ones. Papyrus and Water Chestnuts are in the same family. What I enjoy about sedges is that they often have such interesting spikes, like the one Ben found, Tuckerman’s Sedge (Carex tuckermanii). It also appears to have finished flowering and started producing fruits. Along with these rewarding finds in the Watershed swamp, Ben was treated to a snack of High-bush Blueberries (Vaccinium corymbosum) as he balanced precariously on top of those floating hummocks! Ben was also rewarded with High-bush Blueberries as he explored the swamp. His treat was only fair, really, since he had to carefully avoid the abundant Poison Sumac (Toxicodendron vernix) scattered through the swamp. 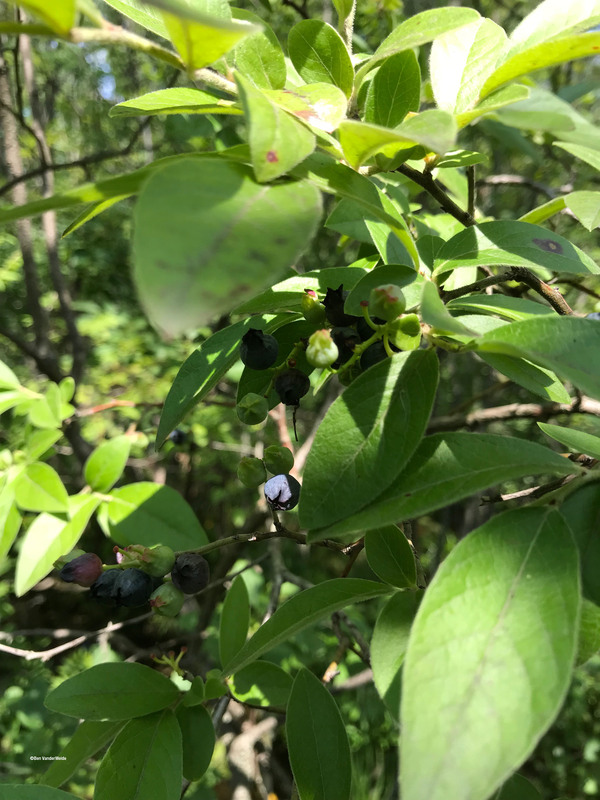 While he came home with a small Poison Sumac rash, it was a small price to pay for discovering cool, new plants and wild blueberries as far as Ben was concerned. 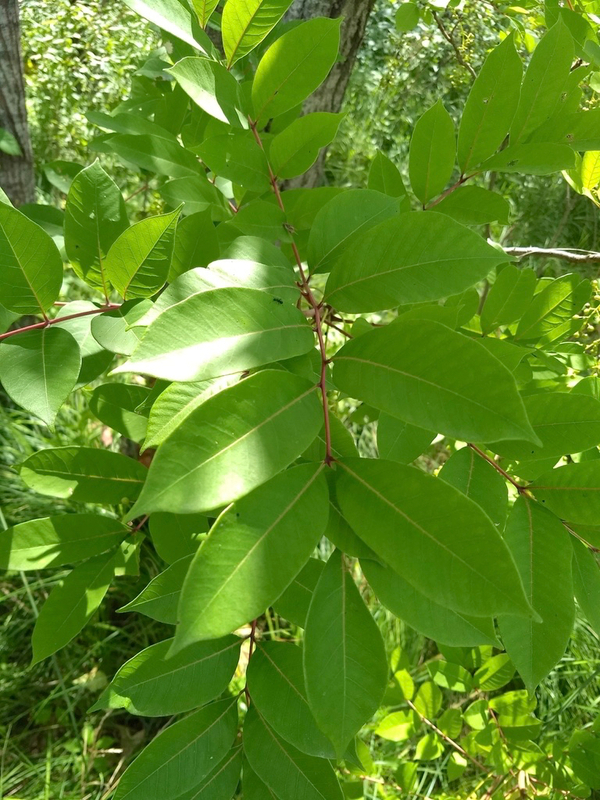 Poison Sumac takes the form of a shrub or small tree and grows only in very wet places like swamps and bogs. My thanks to Ben for exploring this Watershed habitat. I don’t think I’ll be pulling on my waders anytime soon…but I’m very glad he did! 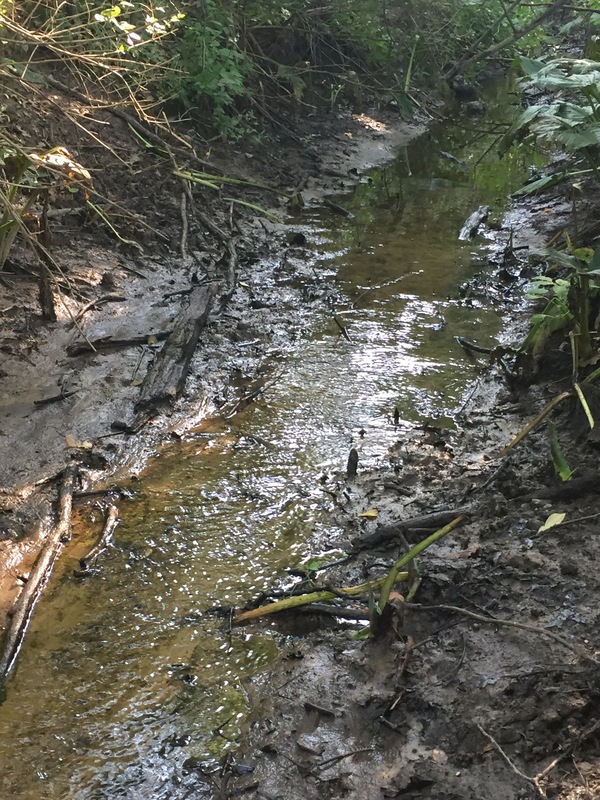 When sufficient rain falls, a small stream flows out of Watershed’s swamp and finds its way through the woods westward, eventually feeding the marsh I spoke of earlier at the foot of the big meadow. It’s not an impressive stream, but it feeds the plants in the marsh, which brings the insects, which feed the birds…you get the idea. Nature depends on connections like that. A small seasonal stream flows westward from the swamp to the marsh at the foot of the big meadow. By now, my damp feet, my tired knees and my socks decorated with Enchanter’s Nightshade made me aware that it was time to leave. So I trudged back up the meadow, through the dim woods where the Pee-wee still asked its question, “Pee-weee?”, along the Fogler’s soy beans and across the lawn to the cornfield beyond the shed. There a group of young Red-winged Blackbirds (Agelaius phoeniceus) hung out on the cornstalks, moving restlessly like a bunch of rowdy teenagers, while their weary elders probably went on molting while hidden in the bushes and fields nearby. 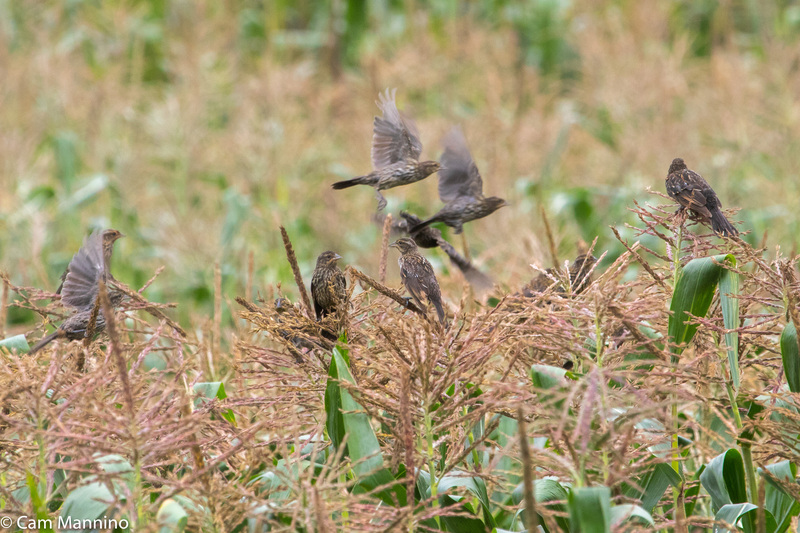 The cornfield became a gathering place for young Red-winged Blackbirds. I was standing next to a large tree stump when a juvenile House Wren (Troglodytes aedon) popped out of the vines that covered it. This young bird was a bit older than the plush-looking little Wren I’d seen at Stony Creek Ravine a few weeks ago. But it was clear that the Watershed wren had still not quite grown into its beak. Surprised at how close I was, it hopped nervously for a moment, looked away, looked back – and popped back into the leafy cover. Caution won out over curiosity. A juvenile Wren who has not quite grown into its beak. It had spotted me but looked away. One last attempt at looking away casually before it disappeared. My Watershed adventure complete, I headed home, content that I’d experienced the natural world in the same way I’d relished it as a child growing up on Lake George Road. Yes, my arm had a few itchy spots here and there, my tired knees felt wobbly and water squished in my shoes – but I’d meandered on paths of my own making, out of sight of other humans, a quiet part of something wild and much older than I – and yet close enough to the kitchen at home that I’d be there in time for dinner. Thanks for coming along.